We all know Lucknow as the city of Nawabs with ancient monuments and busy food streets. Whenever the talk is about Lucknow, tunday kabab and the majestic Bara Imambara has to be mentioned somewhere. But did you ever try exploring the unknown side of Lucknow? As this wonderful city is mostly popular for its historic sites and luscious food, it is commonly frequented by history lovers and foodies. Well, how about taking up the expedition of discovering the beauty of the untrodden paths of Lucknow? If you are keen on doing so, then you must plan a tour of the following temples in Lucknow that have in store a lot to be witnessed and savoured. Read on to know more about these divine beauties and why they deserve to be explored by every traveller and tourist. 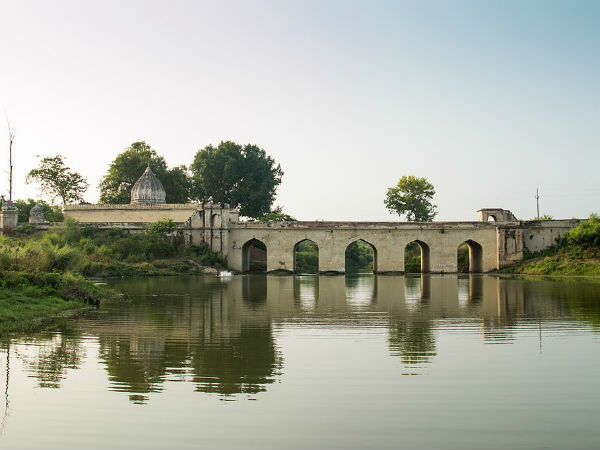 Located on the outskirts of Lucknow, Chandrika Devi Temple is one of the oldest temples in the city and is built on the banks of the Gomti river. Therefore, the environment in and around the temple maintains a serene and peaceful atmosphere. The temple is dedicated to Goddess Chandi and is said to have been constructed 300 years ago. However, as per ancient texts, the temple was established thousands of years ago by the elder son of God Lakshman. It was destroyed completely during the Muslim invasion. Today, the temple is a weekend spot for several local tourists who come here to enjoy the divine aura of the temple and the relaxing environment of the Gomti river. Another temple nestled wonderfully on the banks of the Gomti river, Sankat Mochal Hanuman Temple is one of the most frequented religious sites in the city. Clear from the name, the temple is dedicated to Lord Hanuman and is a significant pilgrimage amongst his followers. Thousands of locals and seasonal tourists come here every year to get the blessings of the lord. It is also said that whoever prays to Lord Hanuman with utmost dedication and devotion within the temple compound, gets blessed with a prosperous and blissful life. The temple was built several decades ago by a Hindu guru, Neem Karoli Baba, who was an ardent devotee of Lord Hanuman. Ever been to any 1000-year-old shrine? If not, then Mankameshwar Temple in Lucknow is you calling. Yes, this beautiful temple dedicated to Lord Shiva is said to be about 1000 year old. If you are looking forward to exploring divinity and Indian history simultaneously, then this temple is a perfect destination for you. During the festive season of Shivratri, it gets flooded with thousands of Hindu devotees and local tourists. So, what do you think about a visit to Mankameshwar Temple and savouring its godly aura? Founded by Ramakrishna Paramahansa, one of the greatest saints of the Modern Era, in the 20th century, Sri Ramakrishna Math is a beautiful temple compound where hundreds of tourists and Hindu devotees come to get lost in divinity. On account of its tranquil atmosphere, it also makes for an ideal meditation and introspection spot in Lucknow. Sri Ramakrishna Math houses several beautiful temples dedicated to Sarada Devi, Swami Vivekananda and Ramakrishna. Nageshwar Shiva Temple is one of the few temples in Lucknow which are of great religious as well historical significance. The temple is said to have been built 300 years ago and is visited by thousands of Hindu devotees every year. During festive seasons, the temple is decorated with colourful lights and flowers, which in turn, allure people from nearby cities as well. The temple also boasts of its peaceful environment. Therefore, it is also an ideal place to feel the essence of divinity in Lucknow.